A large mammal with powerful limbs, a small head, and small, rounded ears. Female black bears weigh 125-150 pounds, whereas adult males are larger, typically weighing 200-250 lbs. 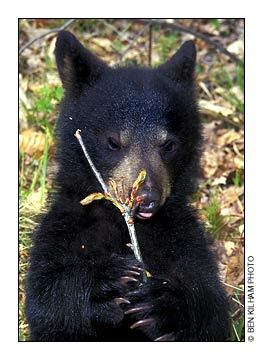 Black bears have several color phases; most in the northeast are all black with a brown or tan muzzle. Some individuals have a small, white chest patch, called a blaze. Black bears have five toes with well-developed claws on each foot. They walk on the soles of their feet, just like humans. Black bears range throughout Canada except the north coast. In the United States it occurs in the Sierras, Idaho and Montana, south through the Rockies into Mexico, northern Great Lakes area, Ozarks, Gulf Coast, Florida, and New England south through the Appalachians to northern Georgia. The black bear is found in ten counties in New Hampshire. A black bears diet is widely varied, taking advantage of seasonally available foods. When they emerge from their den in spring, black bears eat grasses and other newly emerged succulent plants. In summer they shift to more nutritious foods including berries, fruits, roots, blossoms and insects. Hard mast -- beechnuts, acorns, and hickory nuts -- are the staple fall food source. When natural foods are not abundant, black bears will seek alternative foods such as agricultural crops, bees from commercial hives, garbage, suet and sometimes livestock. Black bears inhabit forested areas with thick understory vegetation. Wetlands and riparian areas are important components of their habitat. Optimal habitat typically includes large tracks of forest with little human disturbance. Black bears are not true hibernators as they can be roused from their winter sleep. During deep, winter sleep, their heart rate and breathing drops 50-60 percent, body temperature drops by 7-8 degrees, and they lose a quarter of their weight. 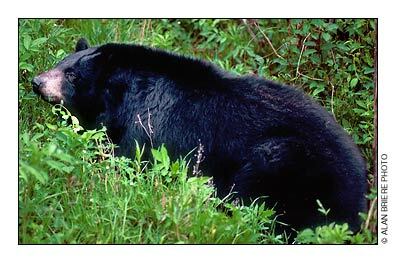 Black bears usually den in brush piles, logging slash or hollow trees, under a fallen tree or under rock outcrops. Typically, winter dens are 5 1/2 feet long and 2 feet high. Black bears generally are solitary creatures.Female black bears first breed between three and five years of age; most breed every other year. Two or three cubs are born in late January or early February while the female is denning. The offspring remain with the female throughout the next winter and disperse the following spring at 18 months of age. During spring, summer, and fall bears may be active during the day, usually at dawn and dusk. In areas with greater human interaction, bears tend to be more active at night. Adult male black bears may range up to 120 square miles, while females range over a smaller area, about 10 square miles. Black bear are best suited to large forested areas with a mix of wetlands, thick understory vegetation, and a diverse source of food including beechnuts, acorns, berries, and other mast. Preferably, these areas are relatively undisturbed by humans and are unfragmented by roads. Read Bear Management Options information from the Northeast Black Bear Technical Committee. Important: To prevent bears from visiting backyard bird feeders, take down birdfeeders from April 1 through December 1. Also keep all garbage secured, keep barbeque grills clean, and do not leave pet food outdoors. This helps prevent property damage and protects our bears by preventing them from becoming nuisance animals that are habituated to human-related foods. 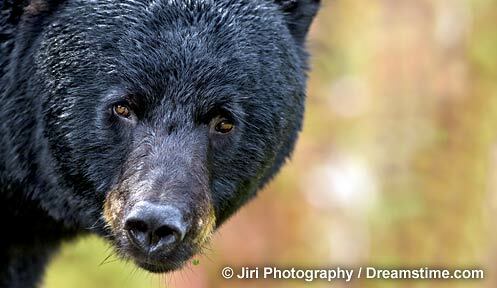 Find out more about living with Hampshire's black bears at Something's Bruin in New Hampshire: Learn to Live with Bears!